I've said it many times, but this is my favourite time of year and every day, as autumn slips by, I've done my best to take it all in. The colours, the fresh air and the beautiful changes in the season all around. I've even collected different leaves to dry and press and mount in scrapbooks to show Ethan one day - but even better, I can't wait to go on a nature trail with him, collecting conkers and pine cones and stomping through piles of leaves. As a young girl, I used to spend hours exploring the woods near my home, making up tales, building dens and watching badger sets and I hope to nurture the same curiosity in the great outdoors in Ethan. 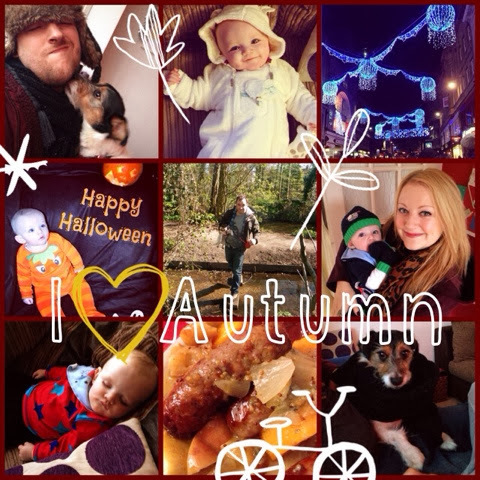 My favourite tip from Emma at Center Parcs was to be inspired by your surroundings. I still love to visit woods and areas of natural beauty but the wonder of autumn is that inspiration can be found on your doorstep too. Autumn is a season you only really realise is upon you by looking around and seeing how much nature changes around you. It goes by so quickly so you need to keep your eyes open and make the most of it before winter sets in. I hope my poem captured the feel of autumn as I wanted to appeal to the senses and paint a picture of my favorite things about the season through words. If my entry was chosen, which truly would be amazing, I would like to visit Sherwood Forest with my baby boy and husband. I've heard wonderful things about this village and love the mystery and legend that surrounds the area. I'd also love to see the new village, Woburn, when it opens next Summer as it looks amazing.